So, this is interesting. Rumors about a game called Call of Duty: Ghosts have been floating around for a month or so, but there hasn't been much concrete info out there. 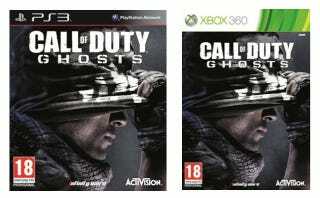 Today, leaked retail listings and box art suggest that Ghosts could actually be a thing. Above you can see box art posted by the retailer Tesco Direct (as discovered by Call of Duty megasite CharlieIntel). Drift0r also claimed the game will be next-gen only, although the Tesco box art throws some water on that theory. Watch the video for more details, keeping in mind, of course, that everything in there is totally unconfirmed. While we don't know if any of this is really true, there are a number of different sources pointing to the name Call of Duty: Ghosts, and it is that time of the year for a new Call of Duty reveal, which traditionally happens around the time of the NBA Playoffs (which started this past weekend). We've reached out to Call of Duty publisher Activision and will update with any comment.